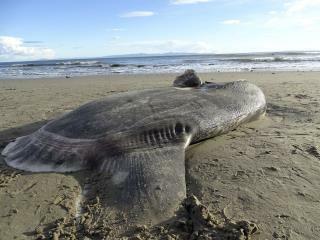 (Newser) – A big sea creature that washed ashore in Southern California has been identified as a hoodwinker sunfish, a recently identified rare species thought to live only in the Southern Hemisphere. The University of California, Santa Barbara, says the fish was spotted last week at Sands Beach in the university's Coal Oil Point Natural Reserve. An intern alerted a reserve staffer, who initially thought it was a type of local sunfish, per the AP. She posted photos to the reserve's Facebook page, which drew the attention of a university professor who examined the fish and posted photos to the iNaturalist online community. That caught the eye of Marianne Nyegaard of Murdoch University in Australia, who identified the species in 2017, and the confirmation was made. So is the fish a stray wanderer or the sign of a local population? That remains unclear, reports CNN, which has a lengthy story on the discovery. Univ Calif at Santa Barbara intern who found it: "Hey, dudes, come look at this HUGE gnarly fish that washed ashore - I almost surfed into it during the mid-term exam for Surfing 3A!" Responding UCSB researchers: "No way! You been smokin' weed too early again, man" Intern: "Way!" Researcher goes out to see it: "Bodacious, dudettes! That is one monster roundish fish! And I didn't imbibe yet today! Let's put photos on snapchat twitter facespace iscience before we get too wasted!" When are they going to dissect the beast and dig out the 50 pounds of plastic in its gut?